How Safe Are Artificial Sweeteners…. One topic that has never died down during these years is the safety of artifical sweteeners. The problem stems from internet messages and information being propagated by unknown sources regarding the dangers of these products. As an endocrinologist, I have been recommending these sweeteners to my patients as they actually help stave off the craving for sugar without necessarily increasing the sugar load. But how much is enough for these sweeteners? Recently the Mayo Clinic organization published views on this controversy and recommendations. The Food and Drug Administration (FDA) has approved the following low-calorie sweeteners for use in a variety of foods. 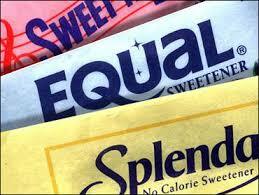 The FDA has established an “acceptable daily intake” (ADI) for each sweetener. This is the maximum amount considered safe to eat each day during your lifetime. ADIs are intended to be about 100 times less than the smallest amount that might cause health concerns. *FDA-established acceptable daily intake (ADI) limit per kilogram (2.2 pounds) of body weight. **Product-consumption equivalent for a person weighing 150 pounds (68 kilograms). ***These products usually contain more than one type of sweetener. How about the safety of these products? Although this is one product has been bombarded with bad publicity probably because of its popularity being present in almost any low calorie foods to diet sodas… the National Cancer Institute and other major health oragnizations including the American Diabetes Association and the US FDA continue to refute these claims… as so far, there’s no scientific evidence that any of the artificial sweeteners approved for use in the United States cause cancer and that there are now numerous studies to confirm that artificial sweeteners are safe for the general population. I for one contnue to use aspartame or splenda for my coffee eevry morning or in the afternoon. I am a user and a believer in these low calorie sweeteners that as long as used properly and not in excess of what is recommended…then it is safe! Enjoy The Sweetness of Health! This entry was posted on	March 25, 2009 at 10:04 am	and is filed under General Health Tips, Medical News Bits, Nutrition Health Tips, Personal Thoughts, The Diabetes Facts. Interesting article. I am not into sweeteners, but do I life my diet cola’s. I have always heard Splenda was bad for you? Hi Penny… just what they said about aspartame. Again…dont believe in what you see or read in the internet especially if they have no basis or true reference from a reputable source.